James Moynagh was the son of John and Bridget Moynagh. John was born about 1897 in Fivemiletown, County Tyrone. The family lived in Annagh Demesne, Fivemiletown.Both he and his father were gardeners. Private James Moynagh was serving with ‘D’ Company with the 7th/8th Battalion of the Royal Inniskilling Fusiliers when he was killed in action in France & Flanders on Thursday 16th August 1917. He was 20 years old. James Moynagh was the son of John and Bridget Moynagh. John was born about 1897 in Fivemiletown, County Tyrone. The 1901 census lists James as age 3 living with the family at house 6 in Annagh Demesne, Fivemiletown, Tyrone. His father was a gardener. The 1911 census lists James as age 13 living with the family at house 3 in Annagh Demesne, Fivemiletown, Tyrone. John was working as an assistant gardener (probably for his father). Family: John Moynagh, Bridget Moynagh, John Moynagh (born about 1894), James Moynagh (born about 1898), Robert H Moynagh (born about 1901), William Moynagh (born about 1903). Private James Moynagh enlisted in Enniskillen. Private James Moynagh had been No 2739 with the Connaught Rangers for a time. Private James Moynagh was serving with 'D' Company with the 7th/8th Battalion of the Royal Inniskilling Fusiliers when he was killed in action in France & Flanders on Thursday 16th August 1917. He was 20 years old. 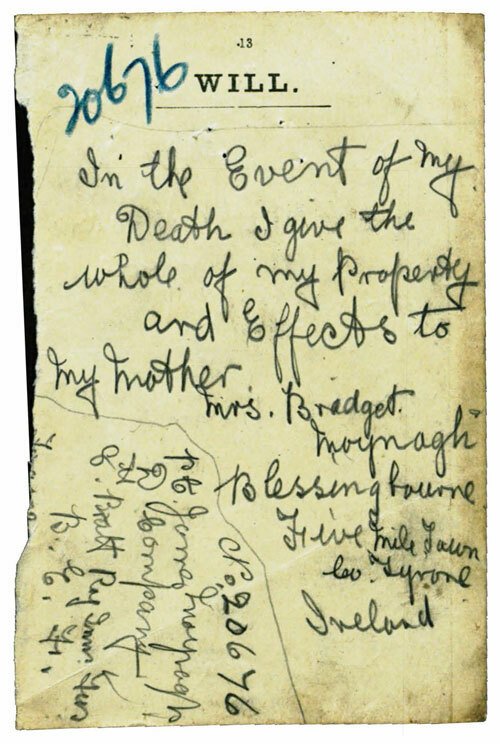 In the event of my death, I give the whole of my property and effects to my mother, Mrs Bridget Moynagh, Blessingbourne, Fivemiletown, Co Tyrone, Ireland. No 20676. Private James Moynagh. D Company. 8th Battalion Royal Inniskilling Fusiliers. B.E.F. The CWGC record Private James Moynagh as the son of John and Bridget Moynagh, of Blessingbourne, Fivemiletown, Co. Tyrone. Private Moynagh has no known grave and is commemorated on Tyne Cot Memorial in Belgium.